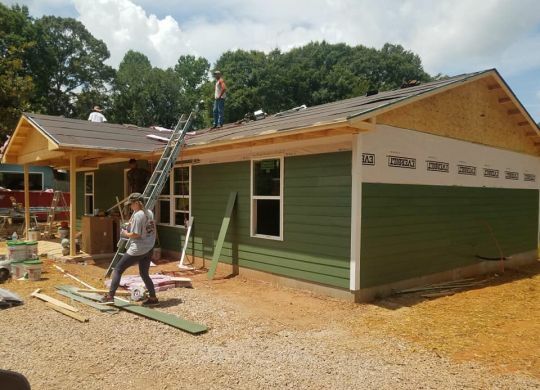 It’s been brutally hot for the dozens of local volunteers working on the new home for Carmen and Rodney Lott in Valley, Alabama, this week. You can imagine what the heat must feel like for house leaders Barry and Amy Stuck of Pennsylvania. Or, you can read Wayne Clark’s outstanding article in the Valley Times-News about the build that began with a slab on Monday, June 18, 2018. On Friday, June 22, volunteers, supporters, leaders and friends will gather at 3 p.m. to dedicate the Chattahoochee Fuller Center Project’s 40th new home build. We will have a complete follow-up report on the milestone build next week at FullerCenter.org.